The Bigton Rowing Club has owned 4 yoals. 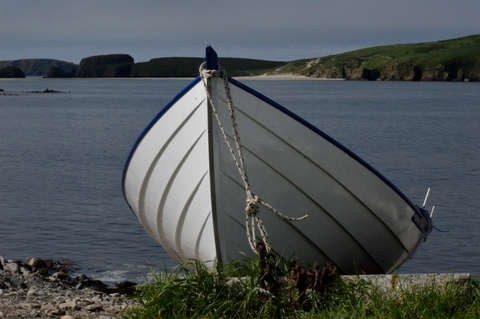 The first one was commissioned in 1995 from a Fair Isle boat builder called Ian Best. It was named Ringansay. This is old Norse for St. Ninian, a 5th century Celtic saint after whom the beautiful island of St Ninians is named. This island is linked by a sand bar, or tombolo, to the mainland at Bigton and it was here, in 1958, that a hoard of silver was discovered in the ruined 12th century church. 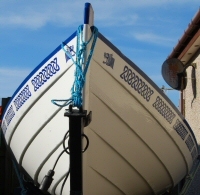 The second boat was purchased in 1999 and once again built by Ian Best. It was called Royrr, which is also old Norse and means reed or rushes. 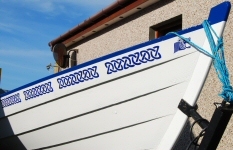 This boat was named after the reed beds of the village of Rerwick, a small village on the outskirts of Bigton. Both boats were built according to traditional methods. 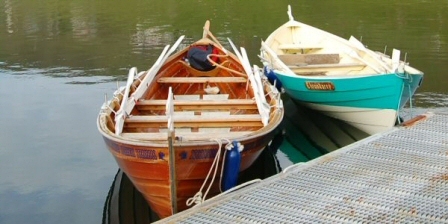 They are clinker built in larch, with 6 planks and carry 6 oars. The Royrr is 22 foot and 9 inches long with a beam measurement of 5ft 8 1/4 inches. The Ringansay is almost identical in shape and size. The photo above, shows the Royrr in the foreground with the Ringansay behind. Behind the Ringansay is the Gonfirth yoal. In the first photo below, the Royrr is on the left hand and the Ringansay to the right. The next two photos show Royrr in her new, 2009, colours. In 2005, another new yoal, Frideray was also commissioned by the club, and built by Ian Best. Her name is the old Norse for Fair Isle, in tribute to the island where all 3 yoals were built. Unlike the others, she is varnished, not painted. 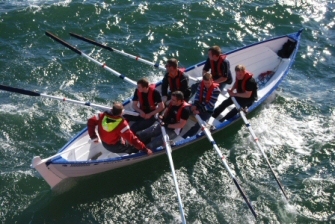 Fridarey was bought by an Orkney rowing club in 2014. We wish them 'aa da best' with her. And look forward to Inter County rowing races! In the first picture below, Fridarey is lying next to the Trondra yoal, Throndarey, just before the start of the Round Trondra race in 2008. The next picture shows Royrr at the end of the Open Men's race at Collafirth in May 2009. Our most recent yoal was christened Havera at the 2015 Bigton regatta. She was built in Whalsay by Tammy Williamson. Havera is an uninhabited island off the west coast of Maywick, Bigton. We regularly row around her, and occasionally go ashore. Each year there are 6 to 8 regattas or race meets. Each regatta consists of 9 races. There are 16 yoals eligible to compete in each of the 9 races. Each team has its own colours. Ours are dark blue and white. Click here to find out when and where we are racing in 2018. If you are interested in rowing, please feel free to get in touch. Contact details are available by clicking here . All rowers, experienced or not, young or, not so young, are very welcome to come and give it a try.